Inspired by an incipient meme. Columns were things that happened to other people. That was the impression I got growing up in Arizona, anyway. I thought they were rare and exquisite creatures, too exotic for my lowly home state. I'd see images of things like Devils Tower and Giant's Causeway in textbooks, and figure that was about it for volcanic columns in the world. I could see things like block-and-ash flows, aa, pahoehoe, and cinder fields, but as far as crisp columns marching through a lava flow, I had no luck at all. To this day, I'm not even sure if there's anywhere in Arizona where you can see such a thing. They certainly weren't in evidence in the areas I tromped as a child. So you can imagine my surprise when I moved up here to the Northwest and discovered columns are pretty much a dime a dozen. Throw a rockhammer at a lava flow, and it probably won't land too far away from a nice group of columns. I'm still excited when I see them, though. Ye olde introduction to columns has been a process of gradual revelation. First came basalt. 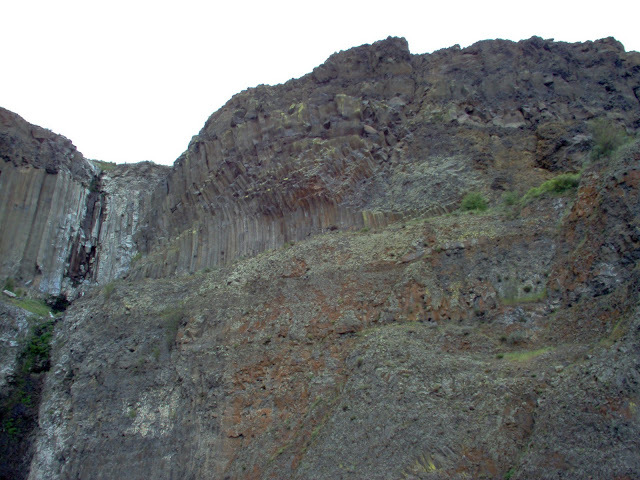 Basalt was another revelation. I'd known in a vague sort of way about things like the Deccan and Siberian Traps and our very own Columbia River Basalts, but for some reason, I hadn't thought much about the appearance of flood basalts. We had trickle basalts if we had anything, so I was used to basalt flows being small, thin creatures (though, believe me, they don't seem small and thin when you're scrambling around the aa at Sunset Crater. My granddad lost his leg to that lava - true story. It can be serious stuff indeed). So early this summer, I stuffed ye olde intrepid companion in the car and went to have a look. 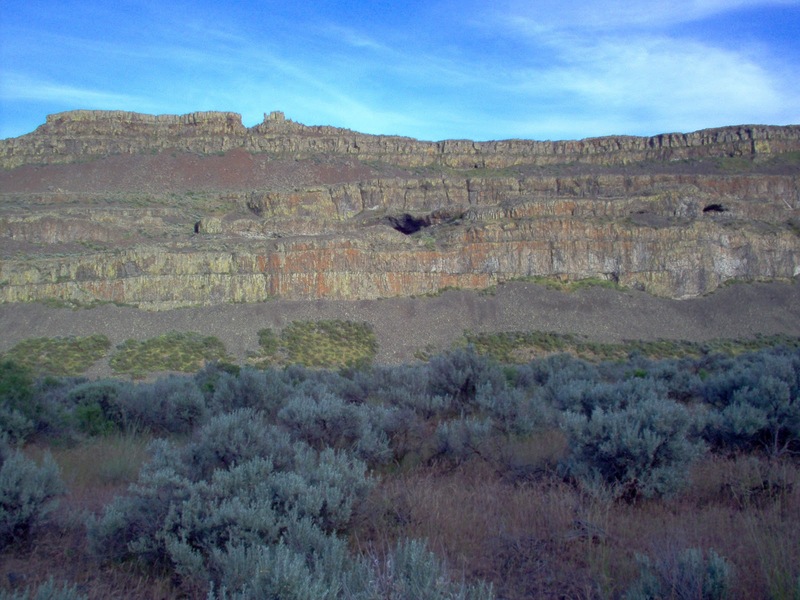 One's first impression of Washington's basalt provinces is massive. Followed closely by, "I didn't know there were so many columns in the entire world!" And what I saw at Vantage didn't even begin to prepare me for the overwhelming columnness of the coulees. Columns march into the distance on both sides of the coulee, layer upon layer of columns. Columns, columns everywhere, and nary a Greek temple in sight. It's a bit overwhelming to someone who'd only seen such things in pictures before. 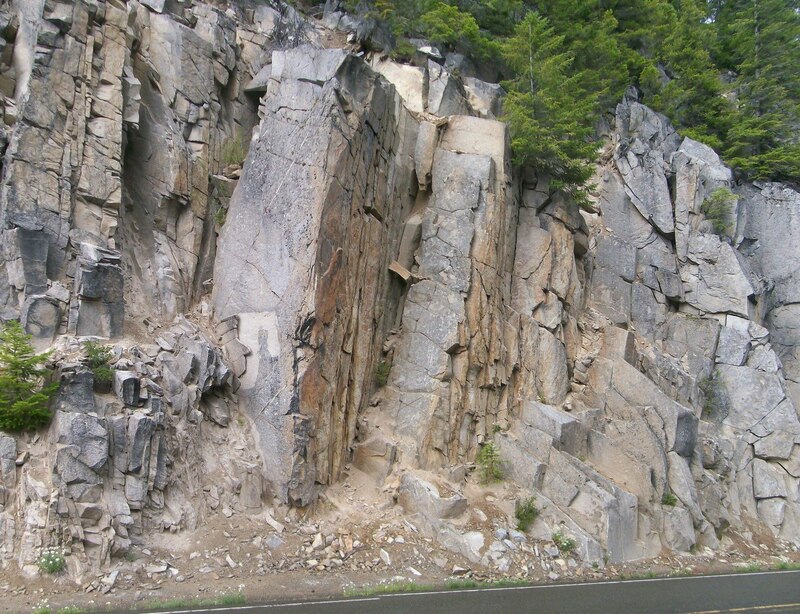 And what will really blow your mind is to realize that all of these tough columns of basalt got ripped, torn, gouged, maimed, and transported by Glacial Lake Missoula's gargantuan floods. Those caves up there? They were plucked. Water just yanked handfuls of columns right out of the walls. And no school textbook had ever told me about the shenanigans columns get up to. And if only I'd had my excellent new camera then, I'd have actual good photos to show ye. Ah, well. You should really go see for yourselves anyway - there's nothing like being surrounded by massive columns of basalt mile after mile to really pump you full of wonder. So, okay. I can just about get my head wrapped round this. Take a big, thick sheet of basalt, let it cool; as it cools, it contracts. Cracks form due to the contraction where bits are coolest and continue right down. Geometrically, polygons make sense in this situation, so you end up with sometimes perfect hexagons, sometimes not - columns can be anything from 3-12 sided depending on the needs of the cooling mass. It helps to imagine mud cracks, actually - as mud dries, you've probably noticed it forms particular shapes. Imagine those shapes going down for many meters, and you've got a pretty good mental model of how columns formed. The entablature's a region where cooling went a little crazy, but it still makes sense: it's still just hot stuff cracking as it cools. Simple! Except when you get right down to it, it's not that simple. If it was, it wouldn't have taken people a great many years and a lot of scientific headscratching to begin to grasp. Because, seriously, when you're first faced with things like this, it's all too easy to think giants must've done it. So, there we were. I'd just about gotten my head wrapped around the fact that large basaltic lava flows on land could and often did form columns during the cooling process. 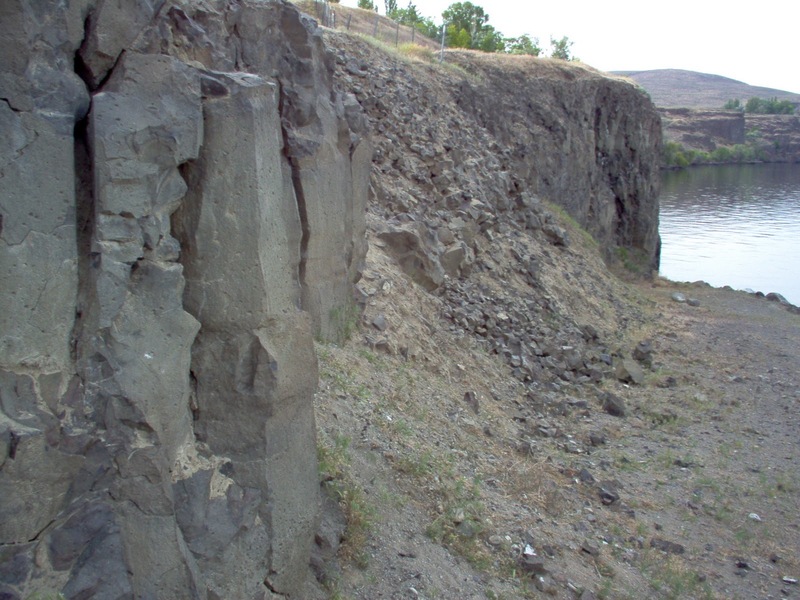 But no one ever told me that other lava flows could form colonnades, and what really blew my mind was the fact you sometimes get them in welded tuff. We're talking hot volcanic ash, here. Nothing like a lava flow. ZOMG WTF?! Opportunistic little buggers will take any excuse to form up, won't they just? Then, just today, I find out they can be found in places like Shenandoah National Park, where they're just about the last things I'd expect. Seems they're not so rare, after all. In fact, I ran into some on our latest trek, when Lockwood hauled us up Mary's Peak (see his photos and writeup of the following). 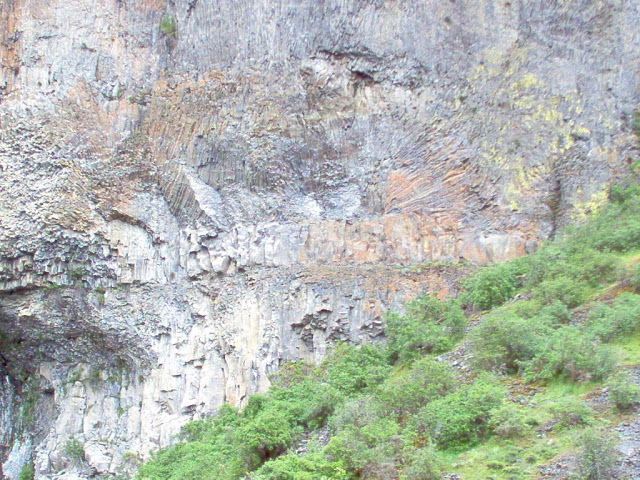 Here we were in the middle of a bunch of Eocene seafloor basalts, and suddenly, columns. Pillows, I expected. Breccia, natch. But columns? In seafloor basalts? For some reason, I'd come to think of columns as exclusively landlubbers. Yet, here they were, born at the bottom of the sea, just like Spongebob Squarepants. Amazing. I'd love to tell you how that happened, but my mad geology skillz aren't quite up to that task. Now I know not to be deceived. "Consider the momentous event in architecture when the wall parted and the column became." 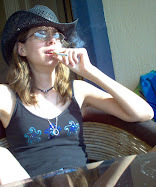 Oh, my, these pictures bring back memories. When I was in high school my buddy and I would climb the columns at Vantage. Living in Illinois now, there's no frame of reference for most people to imagine rocks that size or shape. You wouldn't necessarily guess that it's the same planet. Yummy columns! Good example of how spheroidal weathering can look a little like pillows if not examined closely. Here's another photo from that cut Dana identified as being part of the Stevens Ridge Formation. It's a composite, so there may be some places where the discontinuities are due to stitching the photos together, rather than the rock itself. Columns are just way cool, especially the ones that aren't straight.